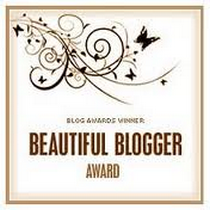 I received the Beautiful Blogger award! On May 10 I received a lovely surprise from fellow blogger Ruth Schiffmann, the blessing of the Beautiful Blogger award! That’s really encouraging since I feel that I’m not keeping up my blog very well between going back and forth (if you are following my blog you’ll understand what I’m talking about) and trying to catch up on the books I have here to read and review on my blog and elsewhere, along with .. just keeping up. Have you ever wondered, as I have … when do I get back to my life? Then I realize .. oh yeah! This IS my life! THANK YOU to Ruth for this cyber hug. Please pay her a visit at her blog, Out on a Limb. I don’t know if I can fulfill the rules for this one, share 7 random things about myself, and then pass the award on to 15 other bloggers – that’s the hard part so I am awarding it to 10 instead. Blessing others is such a joy (blessing) to me. It’s fun to do things secretly, too. When I was a child my eyes were definitely brown, now they are more hazel. I would love to have a dog like my beautiful Shasta who died three years ago this month. She was German Shepherd/Husky/Wolf and had such personality. I still miss her so much. But I also would like to adopt a Greyhound. Anyone have one? I enjoy movies, but not horror or gore or ones that are overly sappy or loaded in swearing. I like movies that do not insult one’s intelligence, although some comedies seem to have that as a requirement. I am starting a list of my favourite words … for no particular reason, I just like them. This entry was posted in Miscellanea, Preambles to Writing, Writing and tagged 7 random things, award, awards, Beautiful Blogger award, Blog, Blogger, blogging. Bookmark the permalink. Oh, gosh! Thanks so very much. I had to laugh while I was looking at your list of “random things” – we’re exactly the same height, I started with brown eyes that turned hazel, and my mom always called me an internet junkie. Such fun. I’ll be sure and visit your other bloggers this week – it’s a wonderful way to find folks who’d remain hidden otherwise. Thank you so much for the award. I like your number 7 the best – random words. It sounds like something I’d do. Words are fun, although my understanding of too many of them is lacking … they are fun to read and try to say and guess their meanings. Congratulations on this award and so well deserved too. Thanks so much for passing it on to me. I am touched by your kindness. I plan to check out the other bolg sites and I’ll try to come up with some random things about me and pass the award along to at least ten other bloggers. Thanks, Darlene. These awards make one think, don’t they? Enjoy! Wow! Congratulations Lynn and thanks for sharing the love. Lynn, I know just what you mean about that “when do I get my life back?” feeling!! And I collect words, too! I have a whole journal where I keep words that I love. Thanks for sharing these fun facts. It sounds like your Shasta was a beauty! Yes, Shasta was a wonderful dog. Perhaps I will write a post about her again sometime. Thank you Lynn for this great compliment!